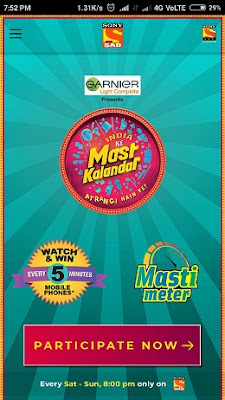 Play and Win Prizes India Ke Mast Kalandar - India Ke Mast Kalandar is the Hindi Reality Show and has been currently telecasting on Sony SAB TV and streaming live on the SonyLiv App. As we are already aware of this that "Dus Ka Dum" has been performing well on the SonyLiv app and providing the opportunity to all those people out there who are playing this game on SonyLiv app Live and Winning Prizes. Now "India Ke Mast Kalandar"(IKMK) has also come with Play-Along live on SonyLiv App to Win Smartphones in Every 5 Minutes. Play India Ke Mast Kalandar - Sony Sab Tv Show's India Ke Mast Kalander is sharing the same concept as we have seen in Sabse Smart Kaun Show on Star Plus. There on that show, we have to use "Common Sense". But here in this "India Ke Mast Kalandar on SonyLiv App" is based on memorizing all the Live Events such as the name of the Judges, Host's Name, Participants Performance. If you are able to remember all these things then you can surely answer all those questions which are being asked on the india ke mast kalandar on sonyliv app. As they are promoting this show as Play and Win Samsung Smartphones in every five (5) minutes. That means you have to answer the questions in every 5 five minutes. That is known as "Play-along on SonyLiv App". Like you must have been playing Watch 'N Play Dus Ka Dum. Now you can also Watch and Play along with India Ke Mast Kalandar. Playing India Ke Mast Kalandar on SonyLiv App can give a chance to earn Smartphones in every 5 minutes. India Ke Mast Kalandar enable a feature to participate in their Live Game Show using their Smartphone aka Mobile Phone. Read all the rules to participate in India Ke Mast Kalandar below aka #IKMK. During the Live Game Show, you'll be able to see the performance of the "Weird Kalandars" and you can also judge their performance using "SonyLiv App Mastimeter". You can either select Mast, Supermast or Jabardast. You can check the performance result on the Sony Sab Tv itself. But on the SonyLiv App, you will be able to see the Pictorial Question on your Mobile Phone related to the Show. You have to be very quick to answer all those questions on the SonyLiv app which has shown to you during the show SonyLiv App. Since you have to be very quick and fast to opt (select) your correct answer on your Mobile. That may be the rule of first come and first serve basis for answering such questions. If you will be able to answer those questions correctly following these rules then you can win the smartphones in "every five (5) minutes". 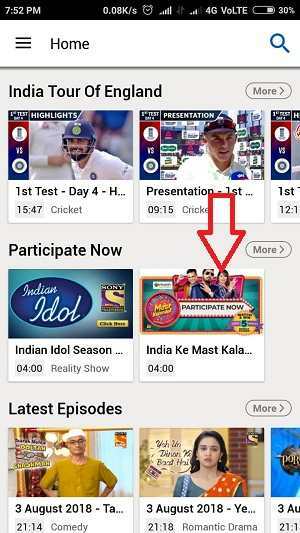 How To Register For India Ke Mast Kalandar on SonyLiv App? So if you are excited to play India Ke Mast Kalandar online on your Mobile Phones. Then you have to download the "India Kem Mast Kalandar App" that is SonyLiv App to play this funny game show that has been telecasting on Sony Sab TV. Now, most of the people are confused to play this game as they are downloading any particular apk app to play this India Ke Mast Kalandar on their smartphones. You only need to download the SonyLiv apk app for India Ke Mast Kalandar. So better to "download the sonyliv apk app" that is an official app for playing this fun quiz game show on your Mobile. First of all Download the India Ka Mast Kalandar App aka SonyLiv App. Open the SonyLiv App Click on the Three Bar option on the Left Side. Now Login or Register on the SonyLiv App. After this, you'll see the Banner of the "India Ke Mast Kalandar". 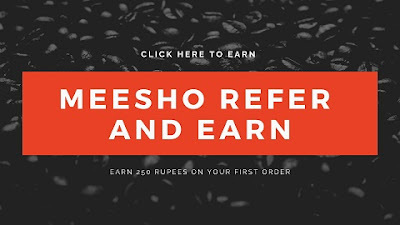 Click on it, next you will see Participate Now. Now Click & Login on either Facebook or GMAIL option. After this Click on accept and terms option and Done. How To Play India Ke Mast Kalandar & Win Prizes On SonyLiv App? India Ke Mast Kalander is an exciting and fun game and it is easy to play on sonyliv app. Just open the SonyLiv app at the right time when the game is going to start. Open your SonyLiv App and watch and remember all the events that you see on the Sony Sab Tv. Like the remember the participant's name. judges name, contestants play and their performance. Now, as soon you see the Questions to appear on the SonyLiv app select the one correct answer from the options that have been given for the particular question. Along with this, you can also see the "Mastimeter of the Contestant's Performance". Just rate the performance of the participants on the basis of your Interest. Like Mast, Supermast, and Jabardast. As soon both judges give their reaction on the contestant's performance. You'll be able to the rating of the same on your TV Screen. Wait for the Sat-Sun at 8 PM as this Game Will be Live on SonyLiv App. Now Click on the Banner of the "India Ke Mast Kalander". After this Click on the Participate Now Option. Now, wait for the questions to appear on your SonyLiv App on your Mobile. Give the correct answer to every question. Be quick and remember all the highlight things from the show. What are the Rules for Playing India Ke Mast Kalandar on SonyLiv App? Rules of playing India Ke Mast Kalandar on SonyLiv App is simple. As we have told you earlier that you need to have a smartphone and SonyLiv app should be installed on it. India Ke Mast Kalandaer game will be streaming live on SonyLiv App. After that, on the app, you'll see Participate Now option click on it and wait for the Live Optional Question related to the Game Show. Try to answer as fast as you can. As we think its depend on the "first come and first serve" basis. Be the quick one to select the correct answer and wait for the end of the show. At the End of the Show, you'll be able to know the name of the Winners on Sony Sab TV. How To See, Check and Determine the Winners On India Ke Mast Kalandar? As per their rules, you have to be very quick, fast to answer the questions. So that you can be sure that you can reserve your place on SonyLiv app to be the winner of India Ke Mast Kalandar online play along on SonyLiv App. At the end of the game show, the winners' name will be displayed on the Sony Sab Tv. However, we are aware of this fact that, in every five minutes there will be questions on the SonyLiv app related to the India Ke Mast Kalandar Contest Show. So try to be more focus on the India Ke Mast Kalander Show's activity and try to remember and memorize the things. To check the name of the winners of IKMK you can see the live results on the SAB TV as soon as the show is going to end. They will immediately show the name of those winners who have won the Samsung Smartphones as per the tagline of this show i.e. #JeetoMobileHar5MinsMein aka #WinAMobileEvery5Mins by play along with India Ke Mast Kalandar. What are the India Ke Mast Kalandar's Questions? In India Ke Mast Kalandar Contest all the questions are being asked related to the show itself. Like if you have seen the performance of the "ATRANGI" participants then the questions will be related to their performance, name, city, age etc. What they have used for their performance? Or What they called their performance? What is the name of their performance etc? Such type of questions that are only limited to the participants can be asked in the India Ke Mast Kalandar Game Show. So always read the Name of the Contestants, City, Age and their Performance Name etc. to answer the question correctly. "This is Not the Official Website. We Are No Way Linked or Affiliated to Sony TV or India Ke Mast Kalandar show. We are only providing the legit information shared by Sony Tv & SonyLiv App and available on the Internet." So if you want to enjoy this India Ke Mast Kalandar show and want to play along to win mobile phones. Playing live along with this show, It can provide the entertainment along with a chance to win a samsung smartphone by giving an answer to the simple questions.